Returning after a 25-year hiatus, the Nintendo World Championships 2015 concluded tonight in Los Angeles with a new world champion: John “John Numbers” Goldberg of Queens, New York. Goldberg defeated Cosmo Wright in a tense final round playing the upcoming Super Mario Maker game for the Wii U console. The new champion emerged victorious after a multi-round competition in games from Nintendo’s past, present and future, including The Legend of Zelda for the Nintendo Entertainment System, Super Metroid for the Super NES, as well as Splatoon, Super Smash Bros. for Wii U and Mario Kart 8 for Wii U, in front of a live crowd of thousands and even more fans watching around the world online. The intense competition consisted of 16 Nintendo fans, eight pre-selected by Nintendo and eight advancing from qualifying rounds held across the nation on May 30. After winning the final round, Goldberg was presented his trophy by Nintendo developer Shigeru Miyamoto, creator of the Super Mario Bros.,The Legend of Zelda and Donkey Kong series, among others. In addition to playing classic Nintendo games they were familiar with, competitors had to quickly think on their feet when presented with Blast Ball, a new six-player sci-fi sports experience, which made its Nintendo 3DS debut during the tournament. Another game announcement came in the form of EarthBound Beginnings, a localized version of the original Mother game for the Famicom (the Japanese version of the Nintendo Entertainment System), during a pre-tournament Nintendo Treehouse: Live segment. Revealed by the game’s creator, Shigesato Itoi, the fan-favorite role-playing game went on sale immediately after the tournament exclusively in the Nintendo eShop on Wii U for $6.99, marking its debut in the U.S. after launching in Japan nearly 26 years ago. The Nintendo World Championships 2015 kicked off Nintendo’s activities for E3 2015, which continues with its Nintendo Digital Event on Tuesday, June 16, at 9 a.m. PT, Nintendo Treehouse: Live @ E3, featuring live game demos and special guests from the show floor June 16-18 and Nintendo Access: Super Mario Maker at Best Buy, a chance for fans that are not at E3 to play upcoming Wii U game Super Mario Maker at select Best Buy stores in the U.S. and Canada on June 17 and June 20. 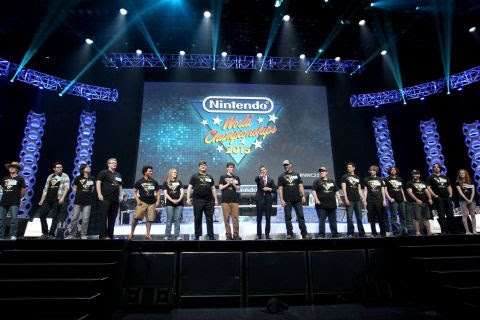 To view a video-on-demand version of the Nintendo World Championships 2015, and for more information about Nintendo’s presence at E3, visit http://e3.nintendo.com/.